AUDI Sport Customer Racing Australia and Chaz Mostert have both been in the news today, with the Liqui-Moly Bathurst 12 Hour central to both stories. AUDI SPORT Customer Racing Australia has shown off their brand new Melbourne HQ for the first time today. The stunning new facility forms part of a huge complex recently finished by parent business, Melbourne Performance Centre. 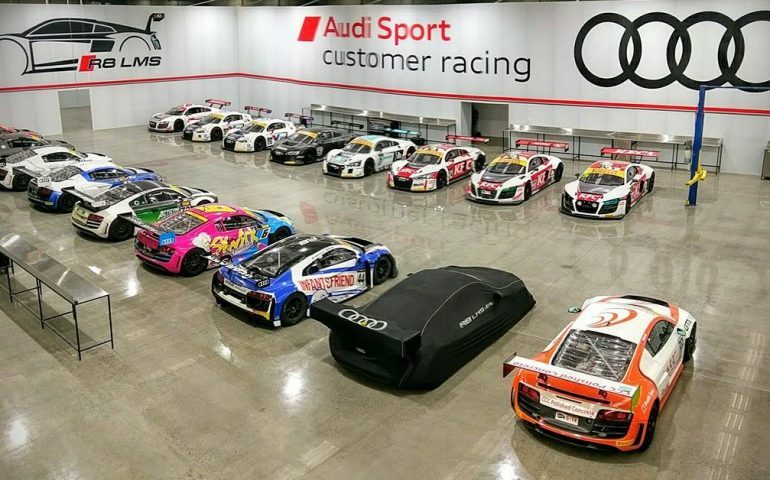 Led by team boss Troy Russell, the team moved their fleet of Audi R8 LMS entries into the building over the weekend, with no less than 17 current and previous-generation cars lined-up and with room to move. The team will host an open day at their new facility in the near future – check out their Facebook page for more details. Audi’s Australian Customer Sports arm will return to the Liqui-Moly Bathurst 12 hour in 2018 with more details about a multi-car attack set to come in the near future. HE STORMED to the lead in this year’s Liqui-Moly Bathurst 12 Hour, and now Supercars star Chaz Mostert will get another crack at winning an international GT3 race driving a BMW. Mostert – who raced for MARC Cars Australia in the 12-hour this year – will contest the FIA GT World Cup this November at the famous Macau street race, driving an M6 GT3 for AAI Motorsports. He’ll team with two-time DTM Champion Marco Wittmann at the Macau event, the German similarly pacy aboard the factory-supported BMW Team SRM entry on his 12hr debut this February. It’s believed Mostert’s stint aboard the privately-entered MARC M6 GT3 impressed the BMW hierarchy, who have remained in contact with the Supercars ace. After qualifying the car second, Mostert grabbed the lead on the 14th lap of this year’s 12-hour and led 20 laps until technical issues slowed his charge – the car ultimately completing 136 laps before retiring just after the nine-hour mark. The Macau event will be held on November 16-19, one week before the Virgin Australia Supercars Championship decider at the Coates Hire Newcastle 500.